I am always looking for a quick and easy dinner recipe. When I forget to plan dinner before I leave my house, I know I can quickly cook this recipe once I get home because it is so simple and I have it memorized. There are only 5 ingredients and it can be cooked in 30-45 minutes. This healthy chicken dinner recipe can have your house smelling good and the meal ready to serve a hungry family in no time. One of the things I like to do is to add my favorite veggies into the rice mixture. Sometime I change up the rice and use long grain rice, the rice does not need to be cooked before making this dish. I have also used Uncle Ben’s rice in a microwave pouch just because that’s all we have had in the pantry. Sometimes I add a salad just because it is super easy to throw in a bowl from my fridge and provides a perfect balance for our family dinner. This is also great for a healthy lunch, it hits all your cravings for something creamy and fulfilling. Just heat up in the microwave and you will have your coworkers super jealous because it smells so good. In a baking dish place the brown rice, half of the dry onion mix, cream of celery, and milk into the baking dish and mix till well blended. Next place the trimmed chicken breast on top of the rice mixture and sprinkle a little of the dry onion mix over each chicken breasts. Place in the oven and bake for 35 minutes or until chicken is cooked all the way (internal 165 degrees and juices run clear). 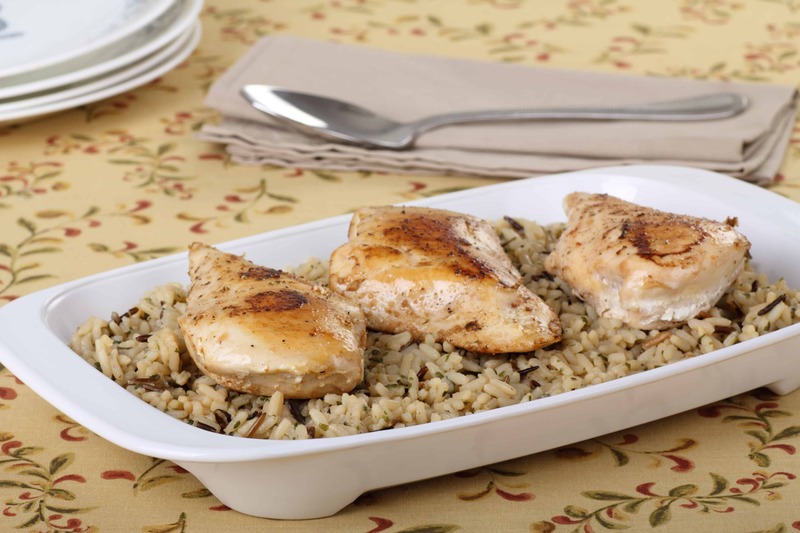 Serve ½ cup of rice with 1 chicken breast.